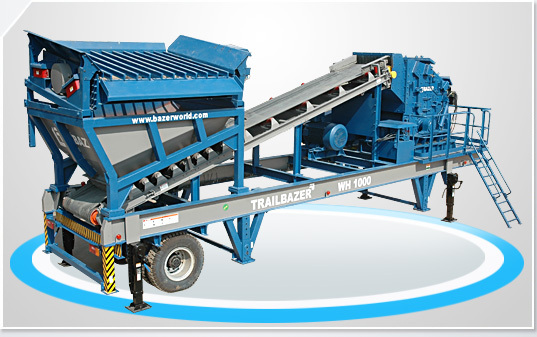 TRAILBAZER - world class mobile Crushing and Screening plants with innovative features that result in reliability and versatility. The "WH" series of HORIZONTAL SHAFT IMPACTOR CRUSHING PLANTS are designed for heavy duty operation at mines and quarries and for contract crushing. The range includes plants that will attain capacities from 135 TPH to 270 TPH in demanding applications from iron ore to aggregate to recycling of construction rubble. BAZER crushers and feeders are modern equipments designed for heavy duty operation and long life. The "WH" series plants are fitted with BAZER Horizontal Shaft Impact Crushers. The "WH " Series comes with a hopper for pay loader or excavator loading provided with vibrating grid for separation of oversize lumps. Each "WH" series plant comes complete with crusher, belt feeder, discharge conveyor, hopper, vibrating grid, chutes and electrical - "All in One" chassis. To start operations the plant is positioned within feeding and receiving conveyors, connected to an electric supply source and crushing can begin. Each crushing plant is designed for ease of access to facilitate maintenance. The chassis are designed for rapid deployment and are easily transportable.